VOX Network Solutions is proud to partner with Verint to help simplify and modernize your customer engagement portfolio.  Together, we provide powerful solutions that can help you drive deeper loyalty, enhance business performance, automate processes, and set your organization head and shoulders above the competition. Verint is a technology innovator backed by amazing people – customer engagement experts who are passionately committed to customer success. By understanding your business goals and working to identify the best approach, strategy, and solutions, VOX and Verint can meet your current and future needs. We believe that together, we can accomplish incredible things. Customer engagement represents a positive, value-creating relationship between customers and an organization throughout the customer journey. 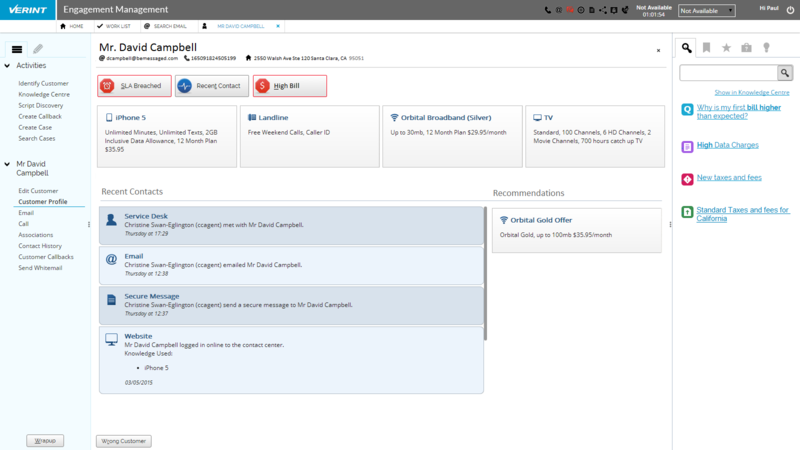 In today’s channel, customers may want to connect through web or mobile self-service, live chat, communities, voice and much more. Voice solutions such as feedback management, interaction analytics and speech analytics, offer you the ability to create a loyal customer base, by consistently delivering value. By listening to what your customers are saying and mobilizing that data into actionable intelligence, you can increase revenue and decrease churn. 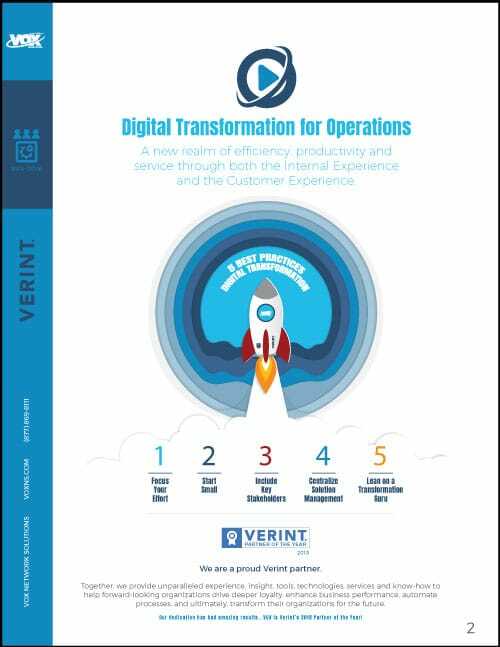 With Verint Workforce Optimization solutions you can drive customer engagement and operational efficiencies across your organization. Whether you want to employ intelligent recording, automated quality management, desktop and process analytics, or robotic process automation, VOX and Verint can ensure efficiency and thoroughness. If you engage your employees you can prime your organization to deliver positive, lasting impressions to your customers. By empowering them with the right information and tools to handle each customer request with care, and speed, you can drive customer success and operational efficiency. 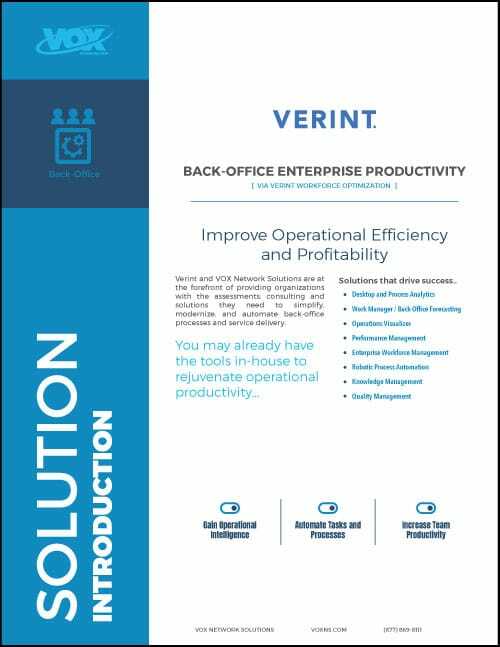 Verint and VOX Network Solutions are at the forefront of providing organizations with the assessments, consulting and solutions they need to simplify, modernize, and automate back-office processes and service delivery. Through Digital Transformation you will: gain operational intelligence, automate tasks and processes, and increase team productivity. In fact, you may already have the tools in-house to rejuvenate operational productivity. A new realm of efficiency, productivity and service through both the Internal Experience and the Customer Experience. Back-Office Operations have an opportunity for significant transformation — from manual processes and legacy systems to using WFO solutions to help achieve desired business outcomes. Extending WFO from the contact center to the back-office can help organizations optimize the entire customer journey, improving operational efficiencies, quality, and service delivery. Organizations need to start small, focus on outcomes, plan and communicate early and often, and provide a governance structure to ensure the solutions are and effectively used to improve decision making and help achieve corporate goals. 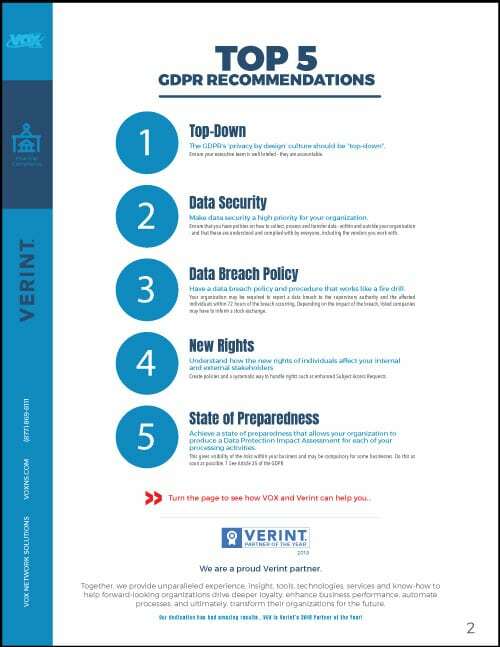 Verint and VOX Network Solutions provide tremendous expertise and experience to help your organization understand and navigate GDPR and overall financial compliance. This document provides five straightforward, no-nonsense recommendations in your path towards GDPR Compliance. The topics are: Top Down, Data Security, Data Breach Policy, New Rights, and State of Preparedness. 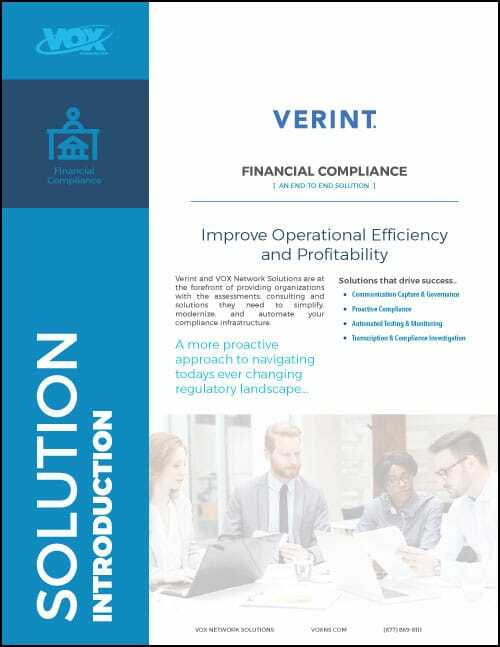 Verint and VOX Network Solutions team-up to drive success for our clients through industry leading solutions and professional services for: Communication Capture & Governance, Proactive Compliance, Automated Testing & Monitoring Transcription & Compliance Investigation.